I cannot garden to save my life. Seriously, I kill mint. Those of you that garden know that mint is often deemed “unkillable”, if that’s even a word. Mint is in definitely not unkillable. I‘ve killed it – several times. But for some reason I always think my black thumb will turn a pretty shade of green every single Spring – that I’ll miraculously transform into some kind of amazing farmer. Well, folks that doesn’t happen – ever. So I’m gardenless and pretty much herbless unless you count the pathetic cilantro and basil plants that Brian continuously has to revive on the deck. I’ve developed some serious garden envy, but Brian’s friend Corey – whom I affectionately refer to as “Husband #2”, brought me some pretty amazing vegetables from his garden. I use the word amazing because they were freaking gargantuan – like veggies on steroids. I decided to tackle the zucchini first and ended up with enough from one vegetable to make three different zucchini recipes. And of course all three of those recipes were desserts – go figure, right? 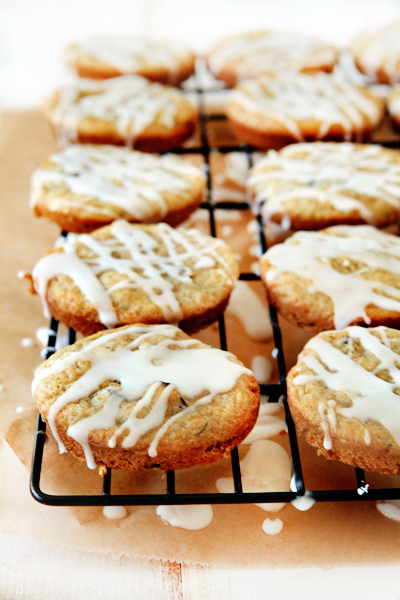 The first recipe I’m going to share with you are these cute zucchini cookies that are infused with a bit of lemon zest and drizzled with a lemon glaze. Before you get worried about vegetables in your cookies, let me go on record as saying that the zucchini flavor is subtle, and sweet. Delectable even. I baked them in my whoopie pie pan because I wanted perfectly round and slightly puffy cookies. But you can totally bake them on a cookie sheet, they will just be – well, less perfect. These little guys are cakey bites of cookie goodness. I especially loved the sunny citrus flavors and the chewy texture from the raisins – and they are the perfect way to use up this season’s overabundant zucchini harvest. What have you baked zucchini into? Corey may dump more of his harvest on me without notice, so I need a few recipes in reserve! 1. Preheat oven to 375 degrees F. Spray a whoopie pie pan with nonstick cooking spray or line a regular baking sheet with parchment paper. 2. In the bowl of a stand mixer fitted with the paddle attachment or with a hand mixer, beat the butter and sugar until light and fluffy, about 2 minutes. Beat in egg, zucchini and lemon zest and vanilla. 3. In a medium bowl mix together the flour, baking soda, baking powder, cinnamon and salt. Stir flour mixture into wet ingredients until just combined. Fold in raisins. 4. Use a medium cookie scoop (1 ½ tablespoons) to drop dough into the center of each whoopee pie well or simply drop them directly onto the prepared cookie sheet. If you are using a cookie sheet, be sure to leave a few inches between each cookie. 5. Bake in preheated oven for 8-10 minutes or until lightly browned. Remove to wire racks to cool. 6. Make the glaze by mixing together the confectioners’ sugar, lemon juice and vanilla extract. Drizzle the glaze over cooled cookies. -If you are using a regular a regular sheet, your cookies will be a bit thinner than the ones pictured above. -Store cookies at room temperature in an airtight container for up to 3 days. What a great way to use up zucchini – the flavours of this cookie sound so perfect! So adorable – I love zucchini! Especially in baked goods, of course. And especially with chocolate chunks. These look absolutely delicious! I must try them soon! Your Spiced Zucchini Cake is one of my all time favorites. I blogged about it last year. I plan to make it again soon. The texture looks so good. 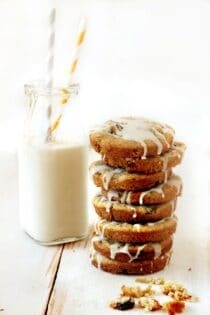 I love adding zucchini to baked goods, just never thought of adding it to cookies! Great way to enjoy cookies and convince myself they are healthy! It is really yummy and reminds me of carrot cake. Hope you try it! It looks absolutely divine! yum yum! Couldnt you use a muffin tin instead? We planted a garden this year, for the first time ever. A 40×60 PLOT sized garden! It is split between 2 families (our 6 in mine, and 3 w/my parents and brother) – so so far we’ve been managing to eat and consume what’s come out of the garden. Of course it’s taking some creative thinking right now to use up the zucchini. Even when we pull everything we can off, usually within 3 days we’ll have several more giant zucchini! Next year, you might try planting zucchini – I’ve heard that pretty much EVERYONE can grow zucchini and no matter how many plants, you’ll always have an abundance! These sound so yummy and a perfect way to use up some zucchini! You really should try growing some. It is very easy. I also have a black thumb and my family makes fun of me about killing plants. (Yes, I have even killed something that my mom said could not be killed!) But the zucchini has thrived in our garden! We like to make chocolate zucchini bread and zucchini fritters. SO yummy! I have also shredded some and frozen it in 2 cup batches to use during the winter for baked goodies. I’ve killed my mint two years in a row now!! I feel your pain! I keep attempting a window-sill garden though, since I don’t have a back yard. I so desperately want a garden! The zucchini at my farmer’s market this year have been HUGE. I love making zucchini bread and muffins, but am always on the lookout for new ways to use zucchini. These cookies look so cute. I am going to have to try them out! Yummy! Never thought to put zucchini in a cookie! After making some whole-wheat banana pancakes, I was inspired to make zucchini pancakes. Haven’t quite nailed it yet, but let me know if you ever figure it out because they’d be sooo good. I just KNOW it. I have a bunch of zucchini that I need to use up, I’m definitely going to give these a try. Love the lemon glaze that goes with them! They look really great and I bet they taste even better. Your recipe has elevated zucchini to dessert status, bravo! And a perfect excuse to purchase a new baking pan, ha! Thanks for sharing this appealing way to use extra zucchini. Those perfectly round cookies look…well…perfect!! I made some zucchini coookies last year but I’m digging the lemon zest and glaze you used in yours. Yum! these sound relaly good! Maaaan! Those look and sound good, I am going to try them without the dairy butter…Mmm Mmm Mmm! which was out of this world. I love baking with veggies. I have the best zucchini cake recipe! seriously A-M-A-Z-I-N-G.
Every time I make this peoples ask me for the recipe. Perhaps you can’t garden, perhaps you’d kill mint but who cares…you make a killer cookie! I have two black thumbs so I hear ya. These zucchini cookies are so clever. Love them. Wow! I love the pics! I just made these today and they are amazing! They are moist and absoloutley delicious! These cookies look great but I am in love with your straws lol! I’ve made zucchini chocolate chip cookies and zucchini chocolate cake, (both are great). I am in love with your cookie recipe and your whoppie pan. I want one. PS I’ve killed mint before too, but managed to keep everything else alive! These do sound good. I will have to make some this next week for an afterschool snack. I am sure they will be a hit. I have been cooking up all the zucchini from my garden! I think my garden was lucky to survive this year! All for cucumbers that the dog dug up, early on! I made cookies, pasta, and with chicken. We have the HUGEST zucchinis in our garden, and this sounds like a great way to use them up! I will try them with a chocolate glaze – thanks soooo much for the recipe! I love your blog! I made these using olive oil instead of butter, ( I discovered, much to my chagrin, that we were out,) cocoa powder, and chocolate chunks instead of raisins. I baked them in a muffin pan and they turned out so perfectly I felt like a master chef! Maybe i will make a cake and frost with buttercream? Hmmm, it sounds like it is worth a try! I also got given some zucchini (courgette) on steroids from someone’s garden recently, I decided to make a courgette and chocolate cake, which was ah-mazing! I am a total courgette convert! Cant wait to see more veggie/baked recipes from you. This recipe looks awesome! I’ve always had an aversion to veggies, but hiding them in cookies is a great way to serve them! They look so pretty too. The whoopie pie pan was a good call. I just saw these on The Sweet Swiper and they sound incredible. I love the combination of zucchini and lemon. Hi! I just saw these on the Sweet Swiper as well, and STILL have zucchini so I can’t wait to make them :) Sending along my recipe for Chocolate Muffins with Hidden Zucchini in case you still have some gargantuan squash as well! I used 1/2 whole wheat flour and 1/2 AP. I also used 1/2 brown sugar, 1/4 white sugar and 1/4 Truvia. Subbed raisins for 1/2 cup chopped dried apricots ( because that’s what I had) and 1/2 cup chopped pecans. The cookie is soft and lightly sweet, and the lemon icing is the perfect topper with the right amount acidity. Great recipe! Just wanted to let you know that I made these zucchini cookies this past weekend exactly as you instructed with no modifications. They were good enough that my husband (who is extremely picky with food) approved them, too. =) Thank you! Yay! So glad to hear the recipe was a success! Thanks so much for stopping by and reporting back on your experience with it. Have a great day! These cookies are nice and moist. However, in my opinion, they were a little blah tasting. I even added extra zest and 1 T. lemon juice. It did not say to flatten the cookie dough but after my “test” cookie, which was a little doughie after 10 minutes, I started flattening them. Much better. I also added 1/2 cup toasted, chopped pecans. The next time my friend gifts me with more zucchini I will make these again – and add even more zest. Thank you for sharing. Thanks for the updates. I appreciate you stopping by. Soooo good. Could not find a whoopie pie pan so I bought a muffin top pan. Increased the cooking time to 13 min. Perfect! Ty so much! Could these be made in a mini muffin pan to keep there uniformity? Just curious, as no whopp!ie pan! Hello! I haven’t attempted this recipe in a mini muffin pan, so I am not sure of the result. I might try a standard or jumbo muffin pan, or you can bake them on a regular cookie sheet if you don’t care about them being identical. If you happen to give it a try, I’d love to know how they turned out. Thanks so much for stopping by.